What does the abbreviation SWR mean and why is this something important to know? SWR stands for Standing Wave Ratio. Radio enthusiasts use a SWR meter so that they can measure exactly how efficiently the transmit power signal is being emitted from a transceiver, or radio, as it travels into the atmosphere through the antenna system. It is vital to use a SWR meter to set and check the antenna so that the radio operator can receive the best overall performance of the radio, or transceiver. 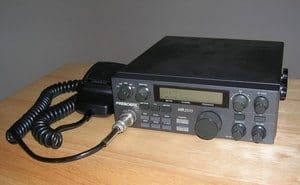 When a person installs a new antenna for a radio device such as a CB radio, marine radio, or ham radio, it is important to check the SWR readings to guarantee that the transmission power that is emanating from the radio and traveling via the antenna is done so correctly. An antenna system that functions poorly will significantly reduce the (transmission and receiving) range of the radio. It may also affect the transceiver. If a signal does not correctly travel through the antenna system then the transmission power can be reflected back through the transceiver which could cause a reduced range and potentially harm integral parts. 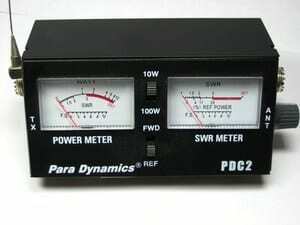 A SWR meter is often used along with a short coax cable to perform a test between the antenna system and the radio. If you receive a poor reading via your SWR meter then there is an indication that you will be having a problem with either the installation of your antenna system or radio. Using the SWR meter to perform a test will indicate whether or not your antenna is properly working. This will allow you to adjust your antenna for optimum performance. A poor reading on the SWR meter usually indicates that there is a bad or poor antenna/radio ground, poor antenna location, an improperly set antenna, or a short or coax obstruction. It is important to note that you should never operate your radio until you have a SWR reading. There are certain radios that have built-in SWR meters, however, most compact radios will not have this feature. If your radio does not have a built-in SWR meter then it is imperative that you purchase one so that you can properly tune your antenna. The majority of SWR meters are inexpensive whereas a meter that checks various radio frequencies can be quite expensive. It is important to note before you purchase a SWR meter that it has the capability of testing the frequency range that your particular radio operates in. For example, a CB radio will operate on 26 to 27 MHz whereas a Marine radio will operate on 156 to 164 MHz. You also need to purchase a short coaxial cable, jumper cable, that has 2- PL259 connectors so that you can perform the test. To obtain the best performance possible it is important to check and set the SWR on all radio applications. When adjusting and testing the antenna, make certain that you check the SWR on both the highest channel and the lowest channel. By setting and adjusting the SWR on all bandwidths, including high and low, it will guarantee that you receive optimum performance for all of your radio channels. A radio will transmit and receive very well across all channels with a SWR reading of 2.5 or less. Your radio will perform better with a lower SWR reading. The following information will explain some of the SWR ranges. This is the ideal range. If you have a SWR reading that is under 1.5 then it means that you are in terrific shape. If your range is at 1.5 but you want to drop it lower, it is possible to do so with different equipment, additional tuning, or a different mounting location. However, it should be noted that dropping from 1.5 to 1.0 will not provide you with a substantial increase in performance. This range of numbers will provide you with adequate performance but it shows that there definitely is room for improvement. There are times, due to vehicle variables or installations, that it is impossible to receive a lower SWR reading than this. However, even though that this range is you should continually try to get it lower. If you have properly tuned your antenna but still receive are in this range of SWR readings then it may mean that you have a less than ideal mounting location. Though this range is not the best for your radio it will unlikely your radio with casual use. You should try to improve this SWR reading if possible. This range is normally caused by a poor choice of equipment or a poor antenna mounting location. Finally, if your SWR meter has a reading that is below one then there is probably something wrong with your SWR meter, antenna connection, or perhaps you have a defective radio.